Newsletter `An Tirisdeach`, No. 400, 22/9/2007. Local news and events including new faces at the school, An Talla, the youth club, councillor Gordon Chalmersand the Community Trust. Newsletter `An Tirisdeach`, No. 401, 5/10/2007. Local news and events including the PWA Wave World Cup and Wave Classic, Cairin`s trip to the Amazon and updates from the RSPB, An Talla and the school. Newsletter `An Tirisdeach`, No. 389, 14/4/2007. Local news and events including the PWA Windsurfing Wave World Cup to be held this October, the death of Rev. W. J. MacLeod, a visit by An Talla committee members to Inverness and Shetland and updates from the GP`s surgery, the WRI and RSPB. Newsletter `An Tirisdeach`, No. 381, 2/12/2006. Local news and events including the annual Tiree Parties Christmas Fayre, an article by the local councillor, update from An Talla and news from the RSPB. Newsletter `An Tirisdeach`, No. 380, 18/11/2006. Local news and events including the erection of the wind turbine mast, the Tiree Cattle Health Group, the Tiree Night at the forthcoming Celtic Connections season, United Auctions cattle sale report, and updates from the WRI and An Talla. Newsletter `An Tirisdeach`, No. 37, 2/9/2006. Local news and events including the new windsurfing T15 club, the new board of the Tiree Trust, a letter from Derrick Wolstencroft in Ireland, market report on the lamb and cattle sale, an update from Tiree Broadband and news from An Talla. 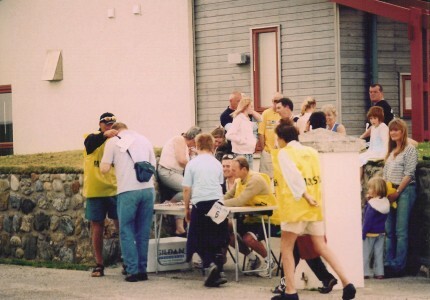 Colour photograph of the finishing line of the Tiree 10K run in 2006. The finishing line of the 2006 Tiree 10K run at An Talla, photographed by Dr John Holliday. Newsletter `An Tirisdeach`, No. 363, 25/2/2006. Loacl news and events including vandalism at An Talla, the establishment of a new Community Development Trust, the cattle sale, A` Bhuain update and news from the RSPB, SWRI, the Tiree Cattle Health Scheme.